Back in 1980, Jim and his daughter Lisa collaborated with author and illustrator Maurice Sendak and Sesame Street colleague Jon Stone on an idea for a film whose storyline could be manipulated by the audience resulting in a variety of outcomes. They met with Sherry Lansing, President of 20th Century Fox, and discussed both the story concepts for “Mischievous Miles” and the technology which would have required multiple film projectors. The project never came to fruition, but in the ensuing years, Jim saw several computer games developed with his characters that allowed for the player to affect the path of the action. In 1986, he began working on another interactive movie idea with Sherry Lansing who was transitioning over to Paramount. Apparently, Lansing had, according to an internal memo, “…found someone who has developed a system that would allow a movie to be truly interactive. So whenever a character in the film turns to the audience and asks them which choice they prefer, the loudness of the response triggers the reel choice.” Jim and his associate Mira Velimirovic commissioned a report on the history and traditions of audience participation. The research emphasized how in early theater, commedia dell’arte, and public puppet shows (like “Punch and Judy”) an important piece was letting audiences know it was acceptable to respond vocally. Storytellers often encourage participation from listeners, asking them to provide sound effects or sing choruses for impact. A major finding of the study also suggested that these situations work best when the story or characters are already familiar to the audience. 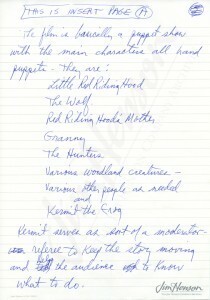 With this information in hand, Jim wrote up a concept: The New and Improved Little Red Riding Hood – Filmed in Wide-Scream Yell-A-Vision! 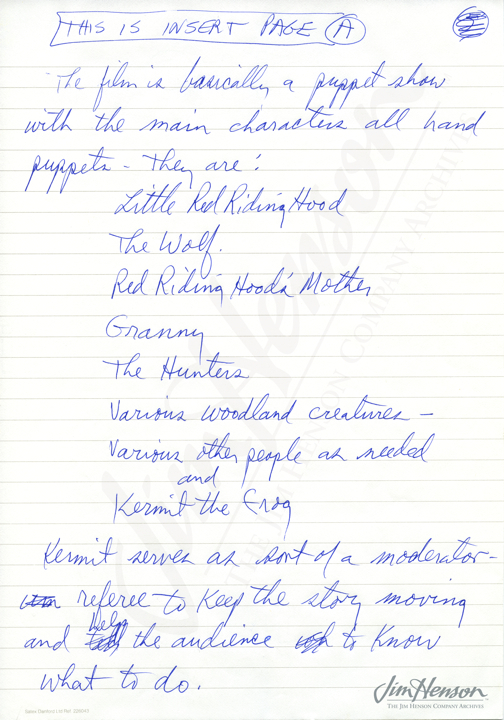 He described a film featuring puppets for the main characters with Kermit as a “moderator-referee to keep the story moving and help the audience know what to do.” Potentially, a live guest or two would appear – someone like “Pee Wee Herman, David Letterman, Dolly Parton, or Alf.” By 1987, the idea of using a well-known fairy tale was abandoned and writer Jeffrey Scott (who was a major contributor to the animated series Muppet Babies) was brought in to explore other directions. He produced a screenplay, The Adventures of Spade and Marlowe, a modern-day detective story with familiar elements from 1930s film noir and classic monster movies. While everyone seemed to enjoy Scott’s script, after further development, the team moved on to other things. 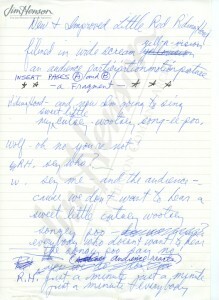 Read about Jim’s earlier ideas for an interactive film in 1980. Pages from Jim’s concept for an interactive movie, 1986. 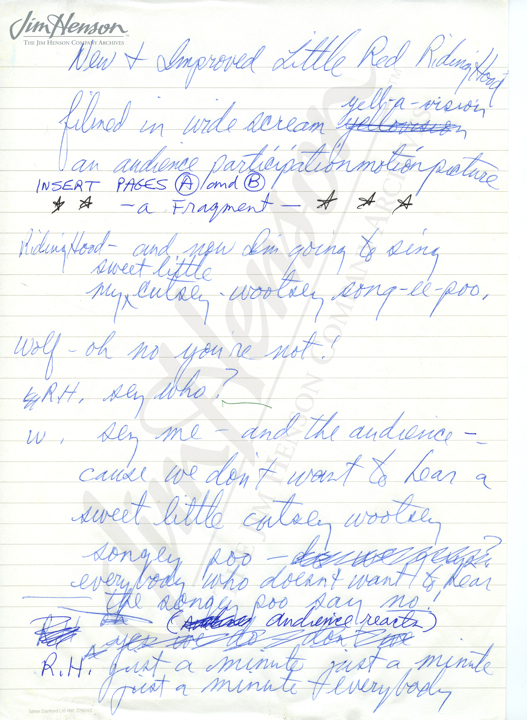 This entry was posted in 09-September '86, 1986 and tagged 20th Century Fox, Jeffrey Scott, Jon Stone, Lisa Henson, Maurice Sendak, Mira Velimirovic, Mischievous Miles, Sherry Lansing, The Adventures of Spade and Marlowe. Bookmark the permalink.